Kalinga Institute of Social Sciences (KISS) will provide education to three daughters of Dana Majhi, who was in news recently for carrying his wife’s body of on his shoulders for 10 km. The decision was taken after many tribal organizations of Kalahandi district, including Biswabasu Sabar Samaj, District Tribal Society, All Odisha Banjara Samaj, Tribal Employees Sangram Samiti, and local MLA Capt. 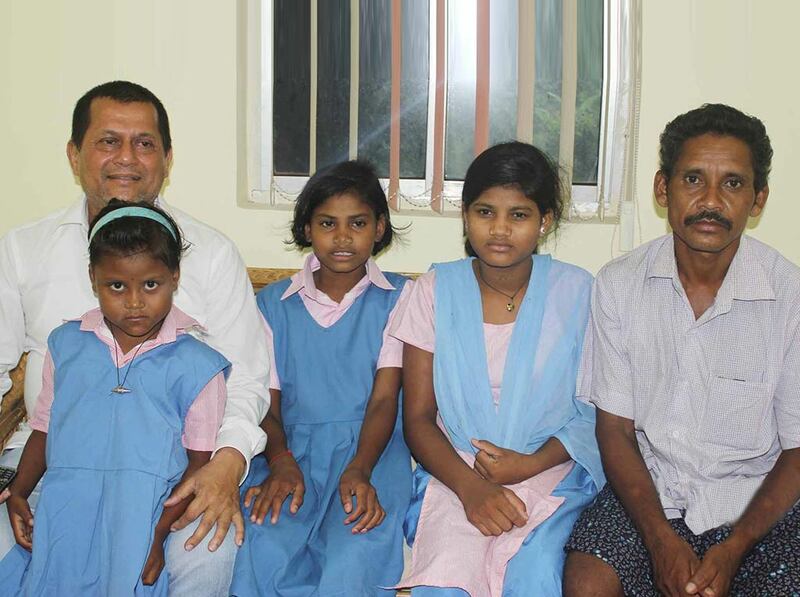 Dibyasankar Mishra requested the KISS authority to take educational responsibility of Dana’s daughters. Representatives from these tribal organizations along with Dana Majhi reached here in KISS today and formally communicated their request to Dr. Achyuta Samanta, Founder, KIIT & KISS. KISS authorities agreed to admit Chandini, Sonei and Pramila, three daughters of Dana Majhi, in the institute. The tribal representatives from the district also requested KISS authorities to open a branch of the institute in Kalahandi. A branch of KISS will start functioning in Kalahandi from the coming academic year, KISS authorities hinted. Though the land for this purpose has already been purchased since 2011, work has not progressed due to paucity of funds. The tribal organizations from Kalahandi further requested to admit 100 more children from Dana Majhi’s village and the local area in KISS, which was also agreed to in principle. Dr. Samanta informed the tribal representatives about financial assistance from Government of Bahrain to Dana Majhi. He has already discussed with the Ambassador of Bahrain in New Delhi in this regard, he informed. An amount of Rs. 9 lakh will be given whenever Dana Majhi will visit the Embassy of Bahrain in New Delhi with a representative of KISS, Dr. Samanta elaborated. As per advice of the Ambassador of Bahrain, this amount will be deposited as fixed deposits in the names of daughters of Dana Majhi, he added.